A remarkable event took place in the latest Netcraft statistics for January 2012: a web server nginx got finally ahead of Microsoft IIS and came in second place on the internet among the Active Sites (namely the sites with unique content). According to that statistics all main competitors lost their positions, and the only nginx went up compared to December 2011. So far Nginx yields to Microsoft IIS in terms of general statistics, namely without filtering concerning the active domains. 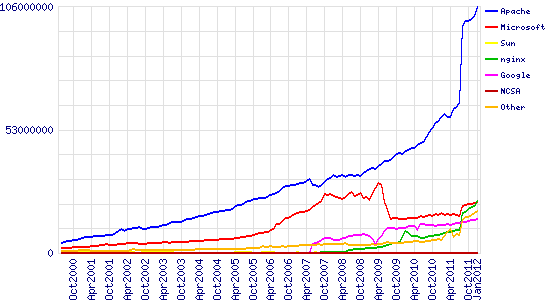 However, here the Russian web server became the only one among the leaders, which built up its share in January 2012.